Have you heard of magic numbers? It’s a fun little phrase that, when applied to patchwork, means something quite simple. Magic numbers are block sizes that fit together nicely, without leaving gaps. 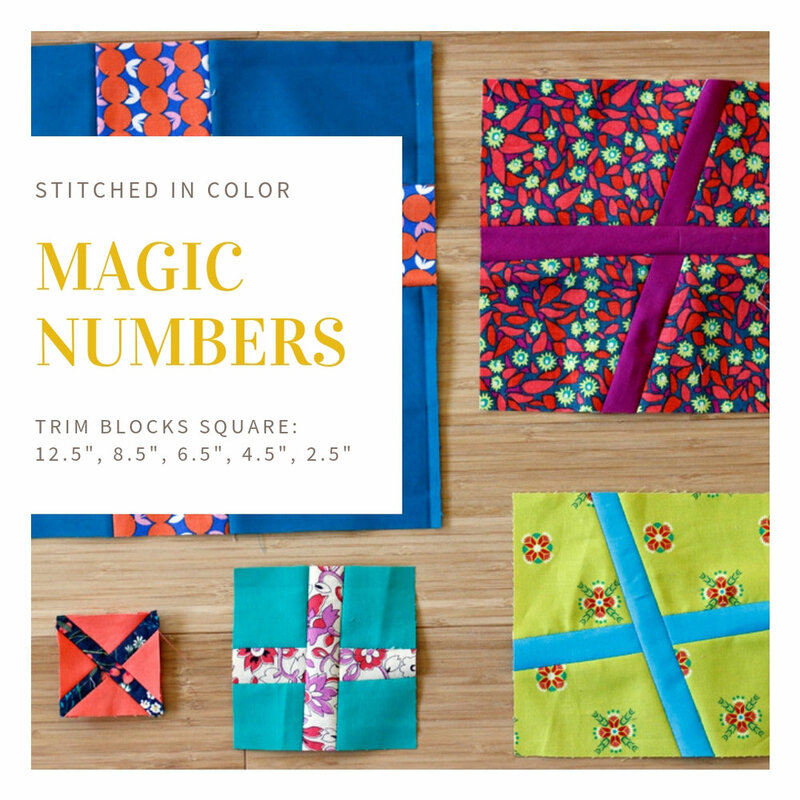 When you want to make an improv-style quilt with blocks in a variety of sizes, you can use magic numbers to churn out blocks that will assemble with ease. These blocks will join together without the need of any background fabric filler..
What makes numbers “magic”? It’s just math! The smaller numbers add up evenly into the largest number, with an extra .5” added on for seam allowance. It’s as simple as 2+2=4, 4+4=8, 8+4=12. etc. For my current project, I’m making improv cross blocks. I’m trimming blocks to 12.5”, 8.5”, 6.5”, 4.5” and 2.5”. That’s a nice variety of sizes for a playful composition. Also, the range of sizes make this project fantastic for scraps! I can use big scraps and little ones, thin strings and wider ones. It’s been a great project to have on hand when I just want to relax and sew, sew, sew. I’ve been building it since New Years day (first sighting) and now it’s spread out nicely on my design wall. Remember, magic numbers for patchwork are simply numbers that add together evenly, plus .5” for seam allowances. I could have done: 12.5”, 9.5”, 6.5” and 3.5”, using multiples of 3. Or, you could do all even numbers like: 2.5”, 4.5”, 6.5”, 8.5”, 10.5”, etc. It’s a simple, but powerful principle. I’ll be back next week with an improv cross block tutorial!